Robert DeNiro and Ben Stiller pose for the L.L. Bean catalog. I think almost all of us can relate to the utter pain of meeting our loved one's parents. It's one of those rituals in lifealong with driving tests and swim instruction in junior highthat can bring about heart failure in all of us. "Meet the Parents" is the new comedy that exploits these fears for comic gold. It's bad enough to meet fathers who are overprotective or just plain mean. But what if that father was Robert DeNiro? Yikes! "Meet the Parents" stars Ben Stiller as Greg Focker (a last name that gets remarkably good laugh mileage for the duration of the film), a successful male nurse who travels to the home of his fiancée Pam (Teri Polo) to meet her parents Jack and Dina (DeNiro and Blythe Danner) for a wedding celebration. In the grand tradition of Mr. Bean and Harold Lloyd, Gregin a neverending attempt to please the parentsproceeds to ruin the matrimonial event through misunderstandings and comic mayhem. Not helping matters is the revelation that Jack was once a CIA operative who has many ways of intimidating Greg during the course of one terribly long weekend. It is apparent very early on that "Meet the Parents" is going to be a full-out mainstream comedy with very little edge and an extreme reliance on whatever the actors bring to the material. Director Jay Roach has hit comic paydirt with his "Austin Powers" films, but showed his true nature with last fall's awful "Mystery, Alaska." In hindsight, whatever success those films achieved was due to the actors, not to Roach's direction. Roach does have a good eye, and his comic timing is getting better with each film, but he is a director that all too often goes directly for the broadest guffaw possible. He skips little laugh beats along the way just so he can hit the one joke the theater can erupt over. The best comedies are ones that subtly scoop up every possible gag lying around, building to the peak where all the elements can come together for a roar. Roach could never be accused of subtlety ("Parents" has gags featuring a flooded septic tank, slingshot champagne corks, and, well, that Focker last name). It's funny stuff, don't get me wrong, but I couldn't help feeling that the laughs could've been stronger, more sustained. Roach leaves it to DeNiro and Stiller to find the nuances in the humor, and the actors are more than up for the task. It's probably the best coupling of talent this year. As the battling father and suitor, DeNiro and Stiller have marvelous chemistry and seem to be enjoying the opportunity for a little cat and mouse gameplay. For DeNiro, it's another feather in the cap of his career. I guess now he can be considered a full-fledged comedian with this role. It comes so easy for him. In the last couple of years DeNiro has been taking on more comedic roles than ever before, and the effect is pure bliss. It's admirable to see the actor reinvent himself. 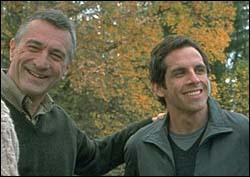 Ben Stiller has built his entire career out of this type of pathos comedy, and "Meet the Parents" seals Stiller as one of the best. A comedian that can wring any scene for maximum comic potential. As Greg, Stiller creates a man who is consistently beaten down by Jack and the family, yet is so desperate to be accepted, that he will go the ends of the world to please them. Yes, it's virtually the same role Stiller had in his biggest success, "There's Something About Mary," but repetition suits Stiller, as he is one of the few with a real vision for his comedy. Standouts in the supporting cast are the wonderful Blythe Danner as the flighty mother and Owen Wilson as Pam's old boyfriend. Of course, since this is going for the audience-pleasing gold medal, "Meet the Parents" feels obligated to shut down the comedy about 90 minutes into the proceedings to give the picture some dramatic weight. It's not needed at all and veers the film wildly off task. Silly and fun is the goal here, not to deliberately take needed energy away to find a heart in the DeNiro character. The man is one of the best actors in film history, he doesn't need the help. DeNiro lays the groundwork for his character all throughout the film. Roach undermines this by needlessly spelling out the obvious time and again. There are enough belly laughs in "Meet the Parents" to go around. Jay Roach should've had more faith in his raw materials.